By 1860, all my Cohen relatives were settled into life in the US, having been here for about ten years. Hart Levy Cohen, my three-times great grandfather, was living in Philadelphia with his three of his adult children, Elizabeth, Lewis and Jonas, and his son Jacob was living with his wife Sarah and their nine children, three servants, and one of Sarah’s brothers, Lazarus Jacobs. The other son Moses was living in the Washington, DC, area with his wife Adeline and their five children. Much would change between 1860 and 1870. First, the decade started off with two major losses. Moses Cohen died on October 2, 1860, leaving behind his widow and five young children. Although the death record I found stated his birth year as 1828, other records would have given him an earlier year of birth, probably around 1823, making him only 37 or so when he died. He was buried in Washington Hebrew Cemetery. Just three months later, the family suffered another loss when the family patriarch, Hart Levy Cohen, died at the age of 88. According to his death certificate, he died on December 29, 1860, of old age. He was buried on December 31, 1860, at Mikveh Israel Cemetery, where many of his descendants would also be buried. One has to wonder whether the death of his son Moses accelerated his demise, although living to 88 in the mid-19th century must have been quite an accomplishment. Here was a man who had moved from Amsterdam to London as a young man, worked as a dealer in goods, and raised five children before losing his wife and moving to Philadelphia as a man in his 70s. He had adjusted to two huge migrations and lived a long life. I wish I knew more about what he was like and who his own (and thus my) ancestors were. A photograph would also be wonderful. But I feel fortunate to have found him at all and to have been able to learn something about this man, my great-great-great grandfather. This was also a tumultuous time in American history. In February 1861, the Southern states formed the Confederate State of America, and in April 1861, with the attack on Fort Sumter in Charleston, South Carolina, the Civil War began and lasted until April, 1865, when the Confederacy surrendered to the Union Army in Appomattox, Virginia. 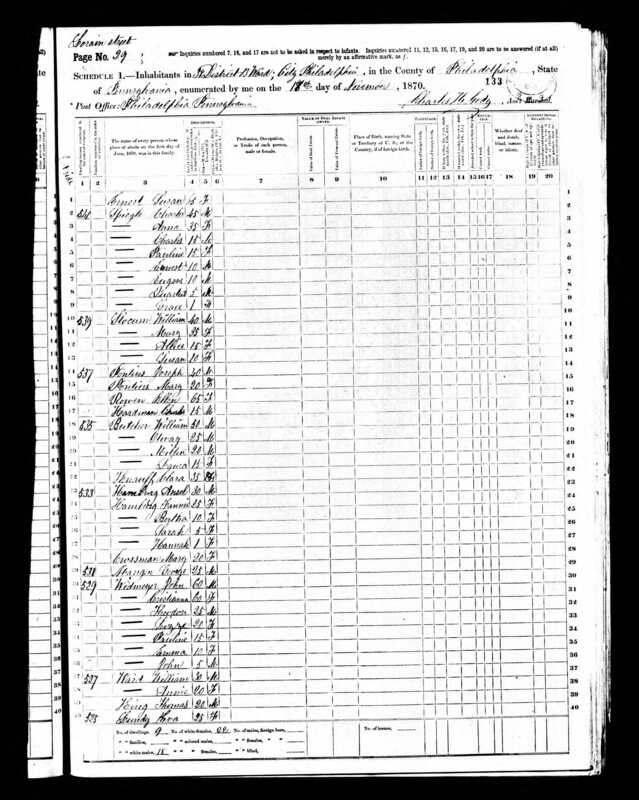 Although I cannot find a military record I could verify as being for any of Hart’s sons, I found my great-great grandfather Jacob Cohen’s draft registration, depicted below. Jacob was listed as having been born in London, living at 136 South Street, where he lived for all or almost all of his years in Philadelphia, and working as a storekeeper. I also found a record indicating that a Lewis Cohen enlisted in the Union Army on April 23, 1861, just as the war had started, serving as a private in Company H, Pennsylvania 22nd Infantry Regiment. The record notes that Lewis mustered out on August 7, 1861. There is also a second record for a Lewis Cohen indicating the he served a private in Company F, Regiment 122 of the Pennsylvania Infantry. I will have to keep searching to see if I can find any further military records to verify that one of these two Lewis Cohens was in fact my ancestor. I could not locate any military record for the youngest brother, Jonas, which seems a little strange since he would certainly have been of draft age, being only 32 when the war broke out in 1861. 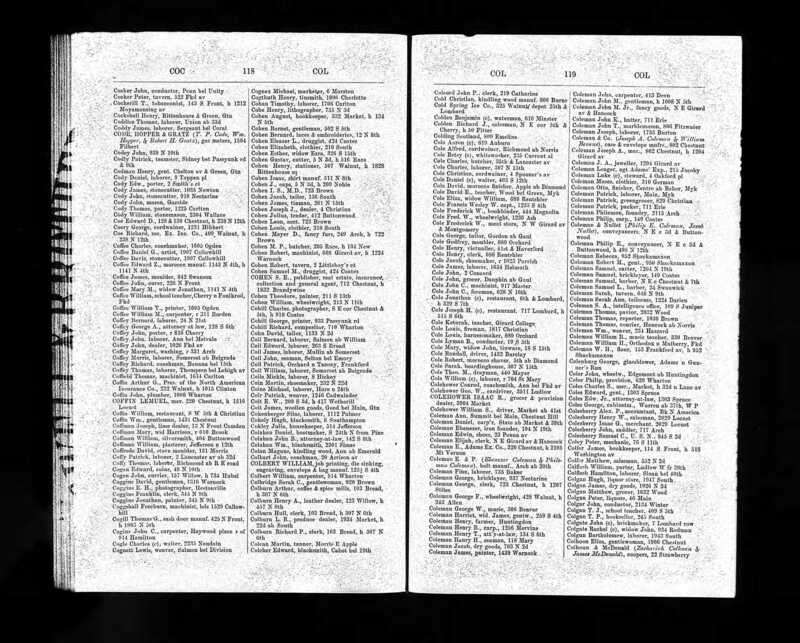 Since both Jonas and Jacob are listed in the Philadelphia directory for 1861 whereas Lewis is not, it may be that Jonas and Jacob never did active duty during the Civil War. In 1861, Jonas was listed as a salesman, living at 210 South Street. In that same directory, his brother Jacob is listed as having a clothing store at 150 South Street and residing at 136 South Street, which may be where Jonas worked. The store was called Jacobs and Cohen and was owned by my great-great grandfather Jacob and his partner, Joseph Jacobs. I will write more about Joseph Jacobs in a subsequent post. The business must have both changed and grown by 1870. On the 1870 census, Jacob’s occupation is described as a “broker,” and the city directories from that point forward more specifically describe him as a pawnbroker. 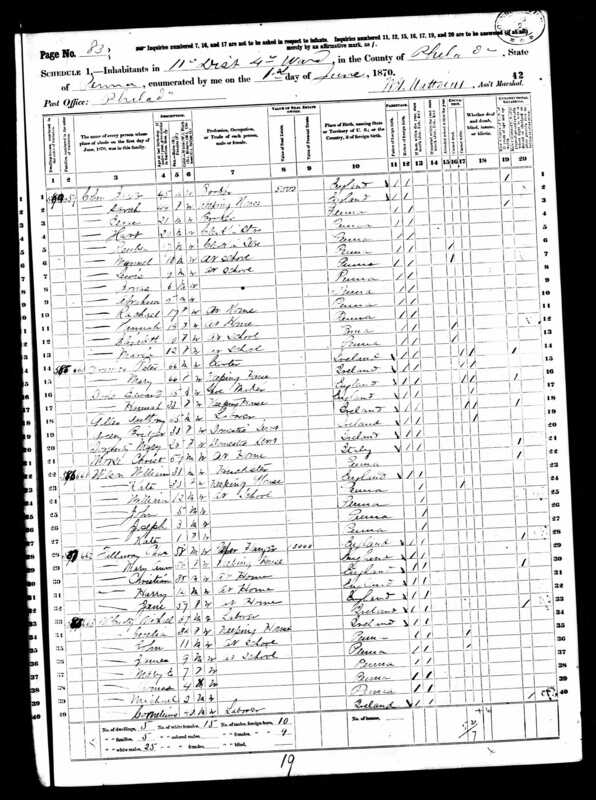 His son Isaac was also described as a broker on the 1870 census, and his sons Hart and Reuben were both described as “clerk in store,” presumably their father’s store. This was the beginning of a long and extensive family business as pawnbrokers. The business was not the only thing that was growing between 1860 and 1870. Jacob and Sarah’s family had also grown between 1860 and 1870. In addition to the nine children they had already had by 1860, Jacob and Sarah had four more between 1860 and 1870: Lewis (1862), Emanuel (1863), Jonas (1864), and finally Abraham in 1866. Sarah Jacobs Cohen had given birth to at least thirteen children between 1846 and 1866; given infant mortality rates, there could have been a few more squeezed into the “off” years. By the time her last baby was born, Sarah was already a grandmother, but was not yet forty years old. She’d been having babies for twenty years. It’s a good thing Jacob’s business was successful. But much as I empathize with Sarah and all those pregnancies, childbirths, and the exhaustion that comes with every new baby, plus all the work involved in raising thirteen children, I am really glad that she did not stop. Their child Emanuel, her eleventh child, grew up to be my great-grandfather. Meanwhile, Jacob and Sarah’s two oldest children, Fanny (Frances) and Joseph, were already on their own by 1870. Fanny, the only child born in England, had married Ansel Hamberg in 1866, according to the 1870 census, and in 1870, she and Ansel were living with their three daughters, Bertha (1866), Sarah (1867), and Hannah (1869). Like her father Jacob, Fanny’s husband was employed as a pawnbroker. Had he and Jacob met in the trade? Did they work together? It appears from the city directories that Ansel was working at a different address, but perhaps there was some connection between the two stores. Fanny’s younger brother Joseph was still living at home and working in the clothing business at 225 S. 2d Street, not too far from his family’s home in 1868. By 1870, Joseph was married, and he and his wife Caroline had a one year old son Harry. 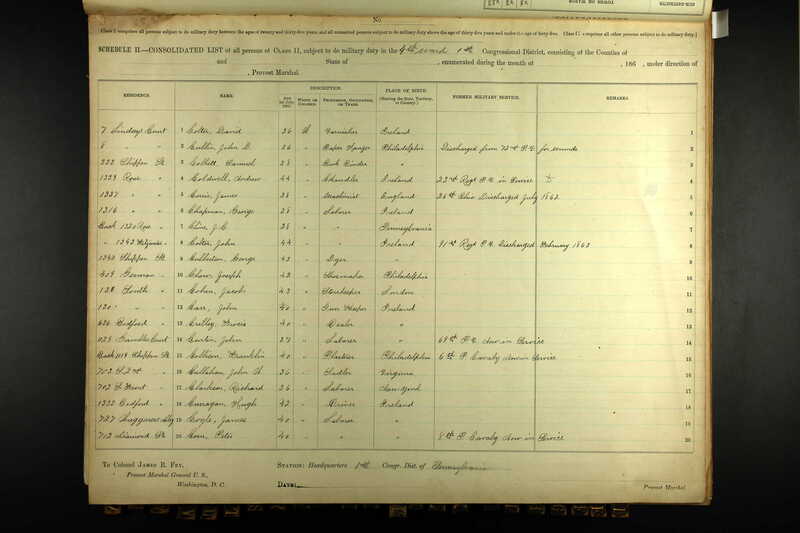 Joseph was working as a tailor, according to the 1870 census and he and Caroline were living in the same ward and district as his family and had a domestic servant living with them. Like their brother Jacob, his siblings Lewis, Elizabeth and Jonas were also working in the retail business during the 1860s. In 1862 Lewis and Elizabeth were both listed in the Philadelphia city directory as clothiers living at 210 South Street. 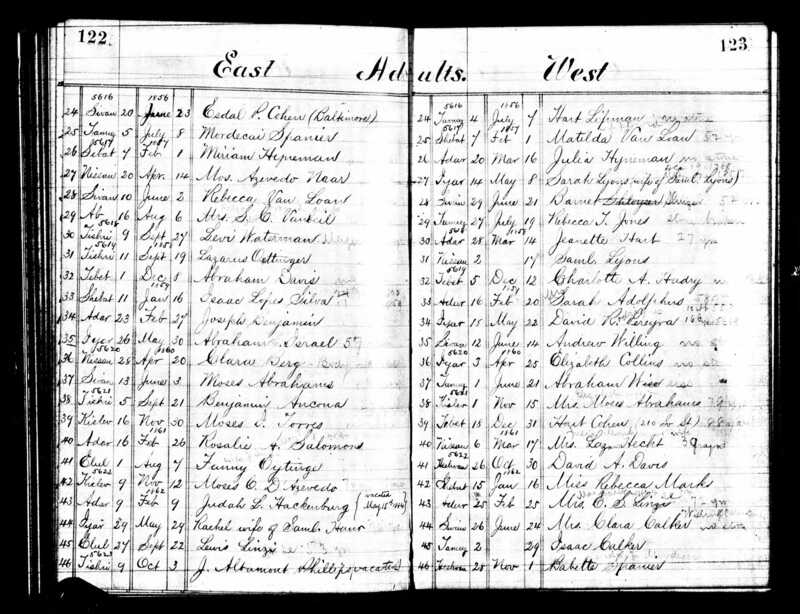 In 1863 Jonas and Lewis were listed next to each other in the Pennsylvania Septennial Census as salesmen. 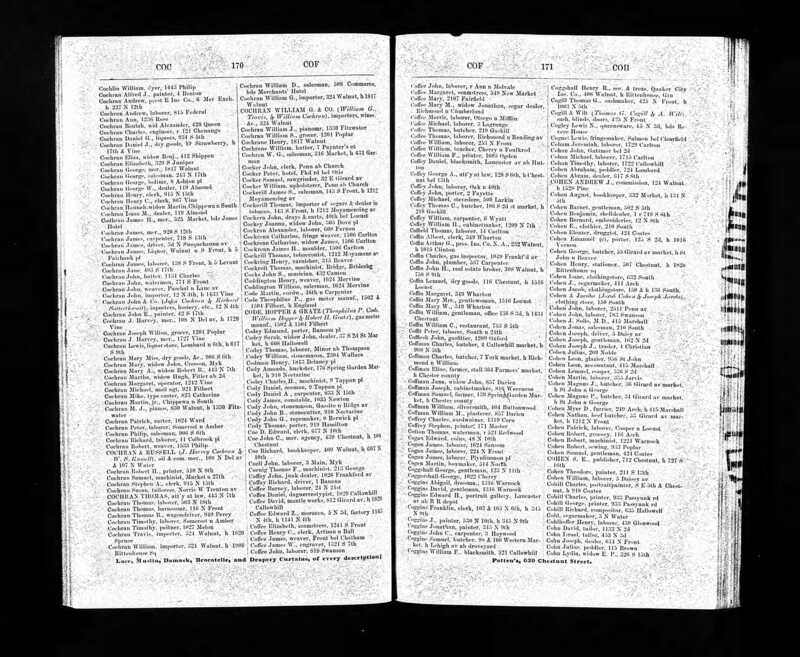 In 1867, 1868, 1870 and 1871, Elizabeth was listed as a clothier in the yearly Philadelphia city directory, and Lewis was listed as a salesman in 1868 and as a pawnbroker in 1871 (Jonas was not listed in either directory). Both Elizabeth and Lewis were living at 119 South 2d Street, not far from where their nephew Joseph was working. I could not find Lewis, Jonas or Elizabeth on the 1870 census, but apparently that census was terribly flawed, resulting in a second count in some major cities, including Philadelphia. Even with a second count, it seems that the census taker missed those three Cohens. Down in Washington, DC, Moses’ family had to adjust to his untimely death in 1860, leaving behind four children under ten in addition to his twenty year old son Moses, Jr. Moses, Sr.’s widow Adeline supported the children by working as a merchant, selling second hand clothing, according to Washington, DC, city directories in 1867, 1868 and 1870. 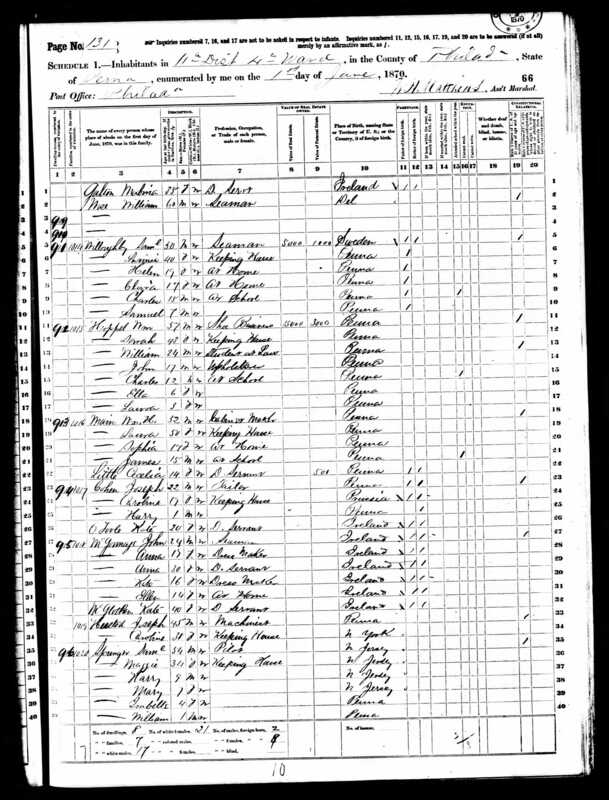 By the time of the 1870 census, Adeline was still living with the four younger children, Hart, Rachael, Jacob, and John, but Hart was employed as a pawnbroker and Jacob as a clerk. 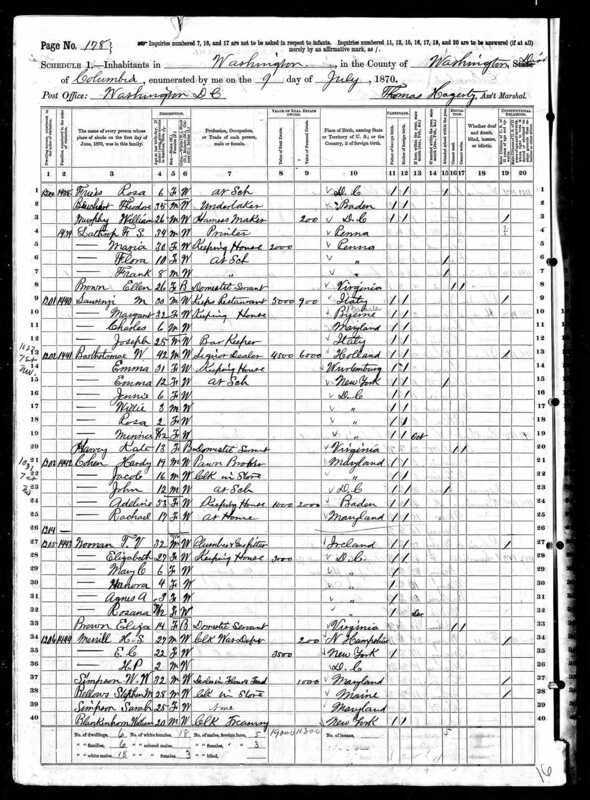 On the census Adeline is described as “keeping house,” so perhaps by that time her sons were supporting her. Adeline and Moses’ oldest child, Moses, Jr., married Henrietta (Yetta) Loeb on August 16, 1862. According to his 1863 Civil War draft registration, he was, like his cousins in Philadelphia, working as a clothier. 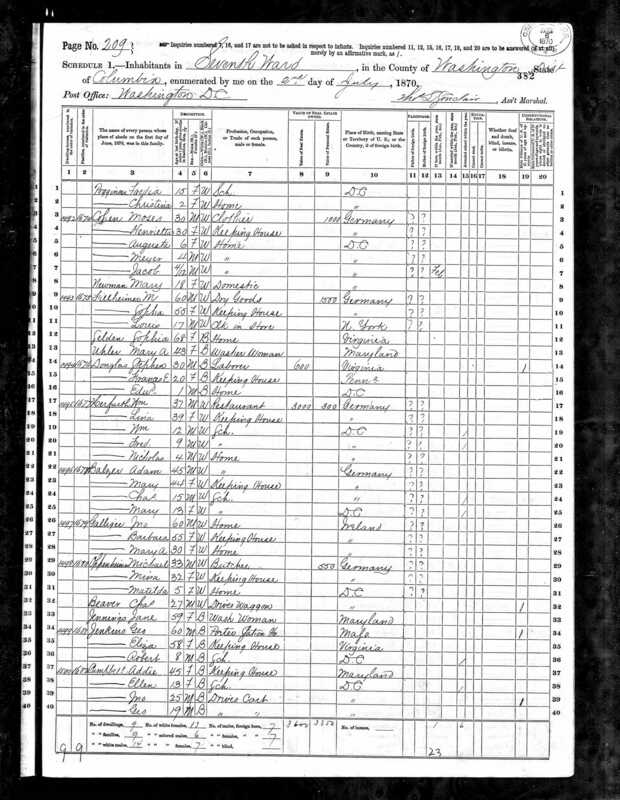 Tax rolls for 1864 and 1865 list him as a “retail dealer.” On the 1870 census, he was working as a clothier, and he and Henrietta had three children, Augusta (six), Myer (four), and Jacob (four months). Thus, by 1870, although Hart and his son Moses had passed away, their families were thriving. Hart’s four children in Philadelphia were all gainfully employed as merchants, starting in the clothing industry and eventually some of them becoming pawnbrokers. Similarly, Moses, Sr.’s widow and children were also involved in the clothing and pawnbroker businesses in Washington, DC. Jacob, my great-great grandfather, was well-established with an ongoing business in Philadelphia, and his children were following in his footsteps. He and Sarah still had many young children at home in 1870, including my great-grandfather Emanuel. The family was still living in Ward 4, but that would start to change as the next generation started to go out on their own, as we will see when we follow the family from 1870 to 1880. That, also, would be a decade of transition for the family as Hart’s grandchildren became adults. These grandchildren were almost all first-generation Americans, not immigrants. Their story is an American story from start to finish. 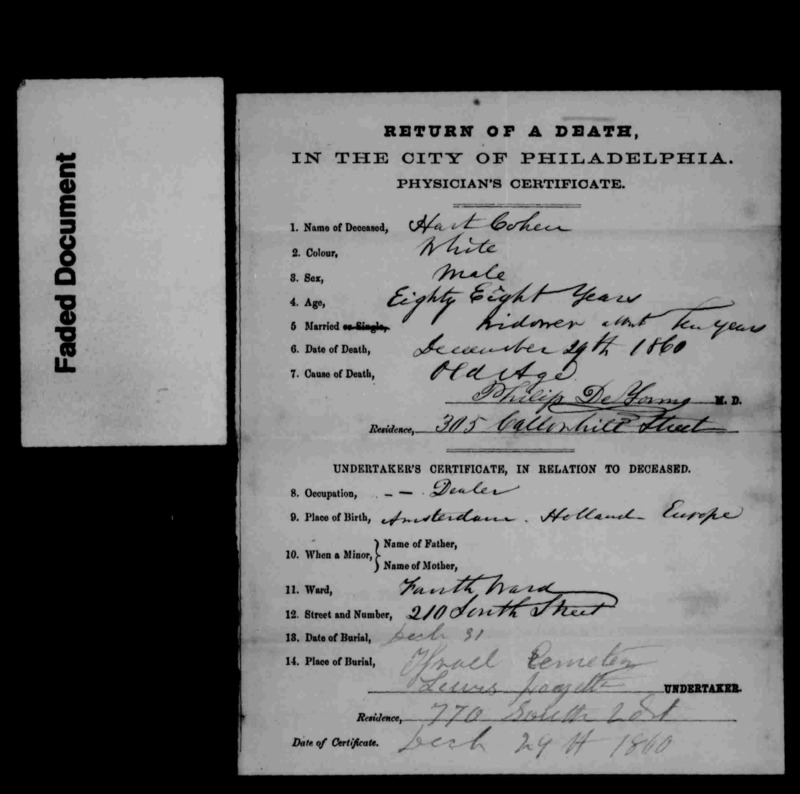 This entry was posted in Cohen, DC, Miscellaneous information and updates, Pennsylvania, Philadelphia and tagged 1870 census, Cohen, DC, England, Hart Levy Cohen, Jacobs, Philadelphia, Union Army, Washington by Amy. Bookmark the permalink. I love how you focused on the decade and even brought in public history. Very effect way of telling the story. Thank you I am really enjoying learning more history as I go. I was always interested in the Civil War as a student, and although my relatives seemed to have had only a minor role, if any, in the war, I could not think about the 1860s without thinking about the bigger picture.